One evening, in the winter of the following year, as he was on his way home, he overtook a girl who happened to be traveling by the same road. She was a tall, slim girl, very good-looking; and she answered Minokichi's greeting in a voice as pleasant to the ear as the voice of a song-bird. Then he walked beside her; and they began to talk. The girl said that her name was O-Yuki ; that she had lately lost both of her parents; and that she was going to Yedo (2), where she happened to have some poor relations, who might help her to find a situation as a servant. Minokichi soon felt charmed by this strange girl; and the more that he looked at her, the handsomer she appeared to be. He asked her whether she was yet betrothed; and she answered, laughingly, that she was free. Then, in her turn, she asked Minokichi whether he was married, or pledged to marry; and he told her that, although he had only a widowed mother to support, the question of an "honorable daughter-in-law" had not yet been considered, as he was very young... After these confidences, they walked on for a long while without speaking; but, as the proverb declares, Ki ga areba, me mo kuchi hodo ni mono wo iu: "When the wish is there, the eyes can say as much as the mouth." By the time they reached the village, they had become very much pleased with each other; and then Minokichi asked O-Yuki to rest awhile at his house. After some shy hesitation, she went there with him; and his mother made her welcome, and prepared a warm meal for her. O-Yuki behaved so nicely that Minokichi's mother took a sudden fancy to her, and persuaded her to delay her journey to Yedo. And the natural end of the matter was that Yuki never went to Yedo at all. She remained in the house, as an "honorable daughter-in-law." (1) An ancient province whose boundaries took in most of present-day Tokyo, and parts of Saitama and Kanagawa prefectures. That is to say, with a floor-surface of about six feet square. This name, signifying "Snow," is not uncommon. On the subject of Japanese female names, see my paper in the volume entitled Shadowings. (2) Also spelled Edo, the former name of Tokyo. 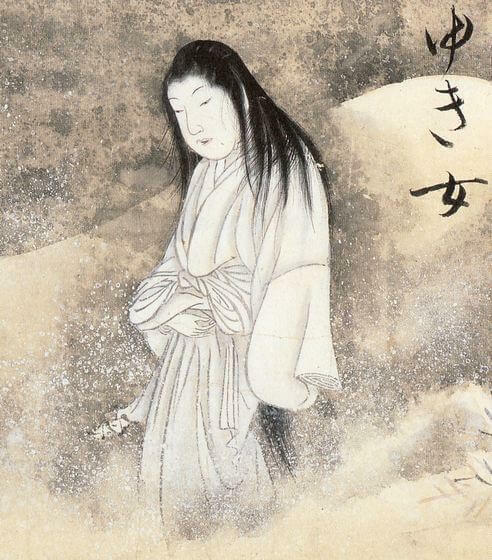 Add Yuki-Onna to your own personal library.